I just set up my Sky Max 16mb account yesterday. I am about 1km from the exchange in Headingley Leeds. (me = LS6 1AH). I get speed test results at about 3.5-5Mbs. My brother has the same package and gets about 12Mbs from these tests. My Downstream on the router shows 11365 Kbps. Is there therefore some problem between my router and my pc? As a last resort i was going to move my whole pc into the kitchen and test it without an extension but this is a little awkward to do. I'd expect on a "up to 16mb" line to get at least more than 8mb on a download. I know my connection says 11365 but i think from speaking to tech support call centre that that figure is estimate. Presumably then the download tests are a better test of the real speed. I can't work out what's causing this. my main BT socket is in my kitchen with an extension going to the lounge where my sky box and router are. this extension is several metres long. Last edited by jmp909; 10-07-07 at 11:41 PM. post up the full stats (you've cut it a bit short), from initial thoughts I see you're on Fast when you shouldn't be (don't ask me why, Sky just not meant to be using it) - are you using wireless, this could also affect things? i'm presuming this is included in the info above but i thought i'd best add it anyway. Last edited by jmp909; 11-07-07 at 12:28 AM. one thing i should add ..
with my current setup there's an extension from the main socket in the kitchen, going into the lounge . the extension plug has 2 phone sockets and an attached cable that is the extension. at the lounge end of the extension is a double plug with 1) Set top box 2) Phone plugged in. given that currently i need to put the router in the lounge.. where should i put the microfilters? i've changed my realtek network card receive buffer size to 64kbs from 8kbs. 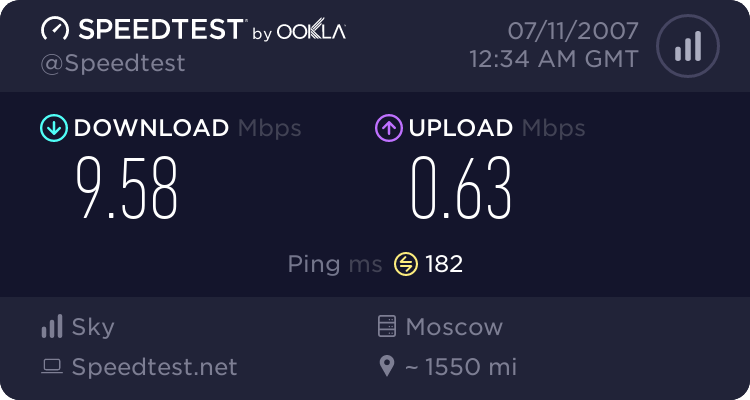 now i'm getting 7.8Mb from Namesco BroadbandMax ADSL Broadband Bandwidth speedtest | Test your ADSL Broadband connection speed instead of the 3-4.5 i was getting before..
i also tried changing my router mode from G.DMT to ADSL2+ and back as i'm not sure this made much difference. can anyone explain any difference different modes might make? hmm, well your sync rate is good so it would suggest a problem at your end, although if the exchange is oversold it might explain lack of bandwidth. The two microfilters look problematic to me although looking at your set-up it would be hard to get around. An extension cable will no lessen the quality of the line, but I'd have thought that would be reflective in your sync rate. now i've got this part sorted, i'll see what i can do with the layout and microfilters.. also since it's late (1am) maybe the network's less busy? Last edited by jmp909; 11-07-07 at 02:02 AM. This way the extension cable is filtered and doesn't act as an aerial picking up stray RF crap.